Two months after a 565-foot crane collapsed in Tribeca, killing a man on the ground, Mayor de Blasio announced stricter regulations aimed at increasing crane safety, including inspecting every single crawler crane in the city. Cranes are supposed to be inspected annually, but the Department of Buildings says sometimes a crane may be end up being inspected several times a year, like when a crane is reconfigured or moved. The I-Team got an exclusive look at what these inspections entail. Crane inspector Ignacio Giacalone recently showed the I-Team a crawler crane at Hudson Yards, similar to the one that tipped over and killed a man in Tribeca. 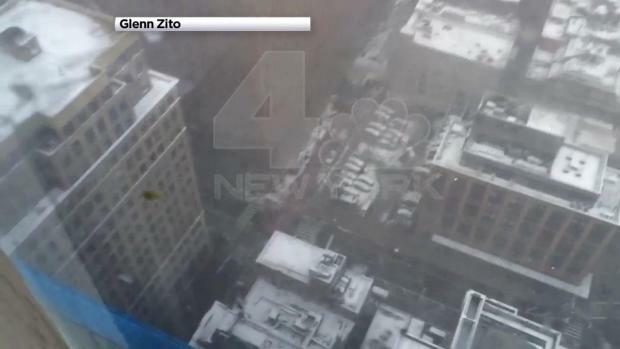 Viewer video shows the moment the crane collapsed in Lower Manhattan Friday morning. Reacting to the collapse, de Blasio first called for all crawler cranes to stop operating once there is a forecast for winds of 20 mph, immediately drawing backlash from the construction industry. Tom Barth, a federally licensed crane inspector, says there was no reason to reduce the wind speed. "That was just a reactionary move, more political than anything else," Barth said. De Blasio adjusted it back to the original wind speed of 30 mph. Barth, who has investigated crane accidents all across the country, says one way to reduce fatalities is to make sure crane supervisors are trained just as well as crane operators. As investigators scrutinize the scene for clues to the cause of the collapse, Chris Glorioso was given rare access to the scene. "I would like to see the superintendents going to school to take these courses to ... understand the regulations and you would eliminate a lot of these accidents," Barth said. 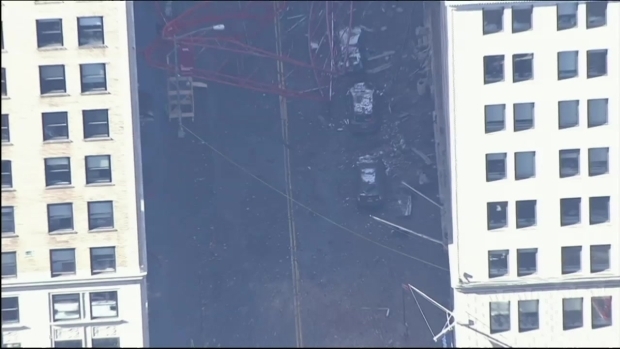 Residents in the area say they were already wary of the massive crane before it crashed. "Here that night, the wind was already ramping up, but there were no construction workers in sight," Bruce Ehrmann said. Through a records request, the I-Team learned that there were 124 violations issued to crane operators last year. Among them were: defective housing equipment, failure to maintain construction equipment, using a crane without a certificate of inspection and failing to comply with the commissioner’s order. Since 2010, New York City has fined and disciplined dozens of crane operators and revoked the licenses of 14 of them. But as many New Yorkers know, construction is a way of life in the city and they see projects popping up daily. Suzy Kurz of Forte Greene in Brooklyn still wonders if there are too many projects too close to one another. Video from over the scene where a crane toppled over Friday morning shows the damaged construction equipment.